Yet another top class product from the smoker’s favourite company Raw, and as always from them, this bamboo rolling tray has been designed with the serious smoker in mind. One quick look and you will see it has a place for everything, including spaces for grinders, lighters, papers and rolling pots. Naturally as you would expect from Raw, there is great attention to detail and build quality with this tray, slots for papers, neat cut out for items such as your grinder, lighter and storage jars, the removable section for your tips and pre-rolls, even this is held in place by a magnet. 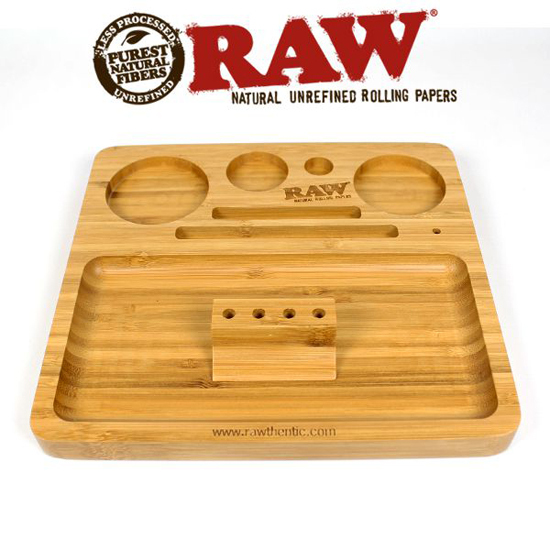 The Raw bamboo rolling tray has been made with attention to detail, rounded corners not for the pleasant appearance, no this is designed to prevent tobacco and herbs from getting stuck in the corners, not forgetting foam feet on the base of the tray, this will not only stop the tray from slipping, but protect surfaces from becoming scratched. The tray is a handy size at 219mm x 203mm x 19mm, and although we illustrate this with a grinder, papers etc., they are not included in our price of £24.99, but can be supplied. Because this tray is handmade from bamboo, the actual form, size and shape will vary between trays. The Lazy-Man Rolling Station is the ultimate rolling accessory for those who like to kick back and relax whilst indulging in their favourite pastime. 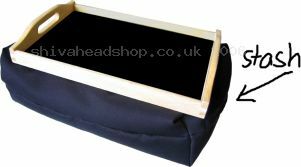 This rolling tray has a cushion fitted for extra comfort and can be unattached from the tray in case you don’t want to use it. The cushion also features a handy zip-up compartment to keep all of your rolling accessories and tobacco in so you always know where it is. The bean bag cushion moulds perfectly to any shape making it a sturdy base for all your smoking needs. The Lazy-Man Rolling Station is available in a range of different colours and designs including flames, 8 ball, skull & crossbones and black and is available now from just £14.99 each. The Lazy-Man Rolling Station is the perfect accessory for those who want to chill out and relax while rolling their cigarettes. 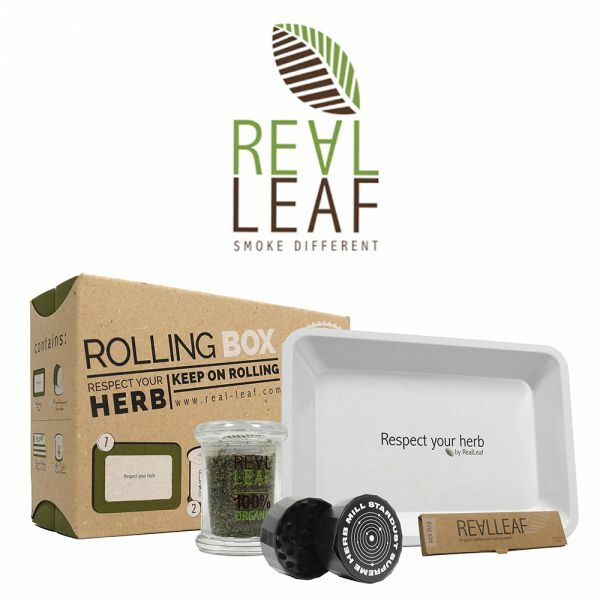 The Lazy-Man Rolling Station has a comfy cushion that has its own stash compartment to keep everything out of the way; it is also detachable so that the tray can be used on its own. The bean bag cushion design effortlessly conforms to your body shape, providing a comfortable feel and sturdy base for all of your rolling needs. The Lazy-Man Rolling Station comes in a range of different designs including plain black, skull& Crossbones and Rasta. 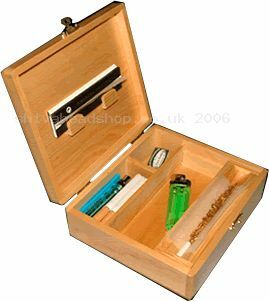 The Lazy-Man Rolling Station is available now from Shiva Head Shop for just £14.99 each, bargain! 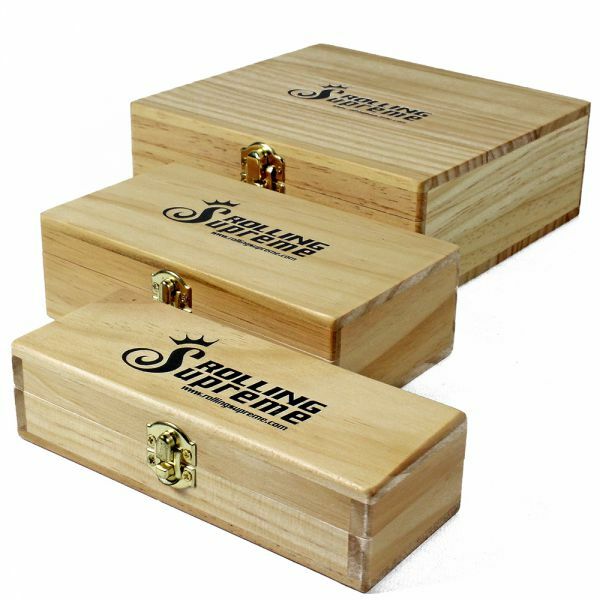 The Original Rolling Tray T3 is a great storage box specially designed for smokers and can house all of your smoking paraphernalia in one place. Made from solid wood, the Original Rolling Tray T3 has numerous compartments to store your tobacco and herbal mixtures, roaches, papers and lighter. The Original Rolling Tray T3 also comes with a removable V-block that can be used as a handy stand when you roll and reveals even more storage. The inside of the lid has a Rizla holder so that your papers are easily reachable just when you need them. The Original Rolling Tray T3 is a great addition for any smoker and looks great on a coffee table. It is available now with 30% off, so it only costs £13.99, bargain! The Original Rolling Tray T3 Deluxe is a great present for any rolling enthusiast and it has enough space to put all of their smoking essentials in. It has space for grinders, papers, filters and tobacco with space left over for all sorts of other things and the V block is a great accessory to help you roll even better cigarettes. 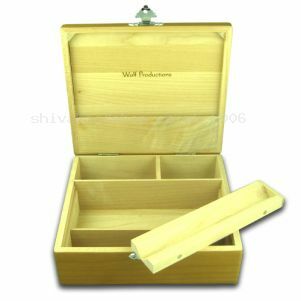 Made by Wolf Productions, the T3 Deluxe rolling tray is made from quality maple wood and will look great, whatever room it’s in. It is available now for just £19.99, so why not give this great give to a friend of family member this Christmas.